Provide comfort for the family of Patricia Virgens with a meaningful gesture of sympathy. Patricia Belle Marshall Virgens, 81, passed away Sunday, February 3, 2019 at Shippensburg Health Care Center in Shippensburg, Pennsylvania. Patricia was born March 20, 1937 in Leonardtown, Maryland to Isabel Florence Graves Marshall and Ira Richard Marshall, Sr. of Loveville, Maryland. Patricia moved with her family to Washington, D.C. as a young child and attended school in the Washington, D.C. Public Schools. Patricia’s family maintained their ties to their family in St. Mary’s County, Maryland and she spent many weekends and holidays on the family farms around Leonardtown, Maryland. She graduated from McKinley Technical High School, Washington, D.C., Class of 1955. She also attended the University of Maryland before leaving college for the world of work, marriage, and family. She married Richard Davis Linscott Virgens, son of Hazel Emogene Prout Virgens and Emil Paul Walter Virgens, on June 9, 1956 at St. John’s Baptist, De La Salle in Chillum, MD. From 1956 to 1959, Patricia worked at the Washington Navy Yard as an administrative assistant. Patricia followed her husband as he changed jobs throughout the years; each move bringing a new change for her to create friendships and impact others. In Reading, PA, she worked with the community social scene to create social events for the community. In Harrisburg, she became involved with local theater, creating costumes for actors in productions like Sound of Music and My Fair Lady. She introduced her children to the world of theater. In Camp Hill, PA and again in Lancaster, PA, she became a Girl Scout leader so that her daughters could begin what would become lifelong adventures with Girl Scouting. Her desire to give her daughters Girl Scouting created opportunities for her daughters and granddaughters to become strong women. In Lancaster, she became a Neighborhood Chairman for Penn Laurel Girl Scout Council where she planned many events and activities that impacted many girls. While in Lancaster, she went back to work in the children’s department of Gimble’s Department Store which gave her daughters a different view of life as she worked and Dad stayed home with the children. She taught her daughters that people did not have to be defined by gender roles. Patricia and Richard owned and operated a shop, Village Framery and Needleworks, in Wellsville, PA. Patricia continued to support her daughters’ extra-curricular activities from theater arts programs to student government, to interscholastic sports and intercollegiate sports. Patricia and Richard ensured that one parent was at every high school and college basketball game throughout their daughters eight years of playing and coaching women’s basketball. 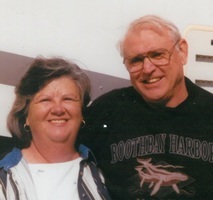 While semi-retired in Pinehurst, NC, Patricia and Richard owned and operated a stock transfer company in conjunction with Consumers Financial Corporation. Patricia is proceeded in death by her husband, Richard Davis Linscott Virgens. She is survived by daughters Linda Anundson (Ron) and Shelly Perry (Wayne); grandchildren Abigail Anundson, Katherine Anundson, Rachel Perry Eichhorst (Ben), Kaitlin Perry, and her companion, Jeremy Hartman; and great-granddaughter, Isabelle Mae Anundson, brother, Ira Richard Marshall, Jr. (Pat), niece, Kimberly, nephew Christopher (Maggie) and children Zach, and Caroline, and nephew, Michael. Funeral services will be held Thursday, February 7, 2019 at 10:30 a.m. in the Fogelsanger-Bricker Funeral Home & Crematorium Shippensburg, with Father Dwight Schlaline officiating. Burial and Internment Service will be at Ft. Indiantown Gap National Cemetery, Annville at 1:00 p.m. A visitation will be held from 10:00 until 10:30 a.m. on Thursday in the funeral home. On-line condolences may be expressed at www.fogelsanger-brickerfuneralhome.com. Consider providing a gift of comfort for the family of Patricia Virgens by sending flowers.